For our friend Tia's Birthday, she asked for something with a chocolate-orange flavor combo. 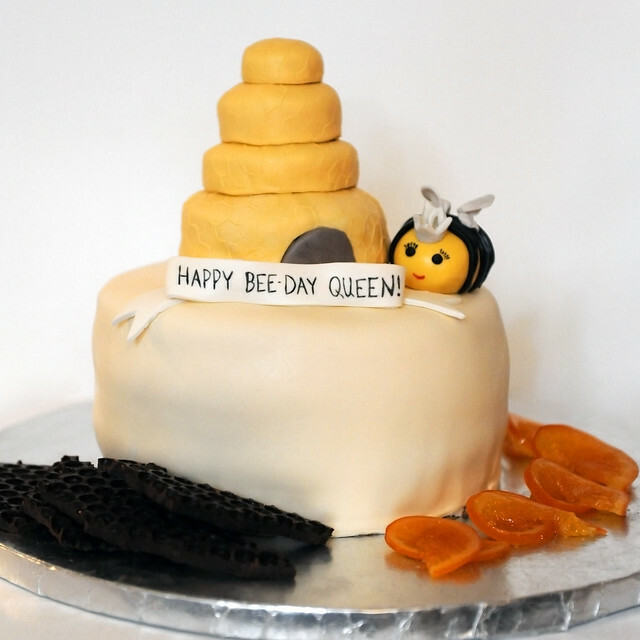 Tia is affectionately called "Queen Bee" or "Queen" by her husband and two boys, so she thought it would be fun to incorporate that idea into the theme. That gave me plenty of inspiration to get to work! For the cake design, I made a 10-inch round cake covered with a butter colored marshmallow fondant. I added a beehive "cake topper" -- a miniature four-tiered cake covered in a pale yellow fondant and rolled with a honeycomb impression. Of course, the beehive wouldn't be complete with out the "queen bee" herself. She was made out of fondant. I added a little bit of silver sugar crystals to her wings and crown for some extra sparkle and drew on the eyelashes and mouth with food decorator pens. The inside of the cake (which I didn't get a photo of) was a three-layer chocolate chiffon cake (a Tartine recipe) with a blood orange mascarpone mousse filling and iced with whipped cream. 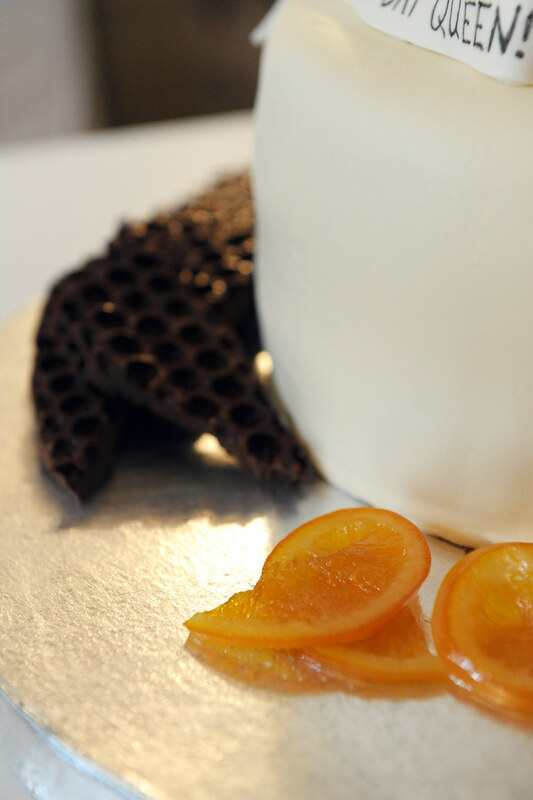 I brushed a little bit of orange simple syrup (leftover from the candied oranges discussed below) on the cake layers. Because the flavor combo was pretty unique, I wanted to give the cake a little bit of garnish to give people an idea of what flavors were hiding underneath the fondant. I candied orange slices using a recipe from Field Guide to Candy. 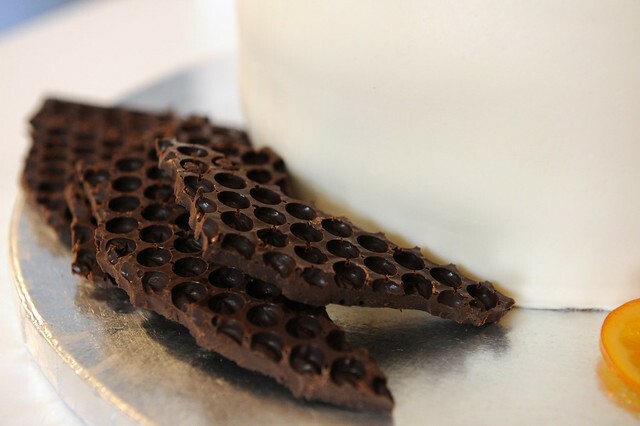 I have always admired the chocolate bubble wrap in DeLessio Market & Bakery, so I decided to try and make my own at home. I tempered 72% dark chocolate and poured on top of bubble wrap and let it sit overnight. It fit in well with the "bee" theme since the impression of the bubble wrap resembles honeycomb. Sprinkle the gelatin over the water, stir and let sit to bloom. In a medium saucepan, whisk the mascarpone with the sugar, add egg yolks and whisk over low heat until fully blended. Heat the gelatin for about 25 seconds in the microwave and quickly whisk into mascarpone batter. 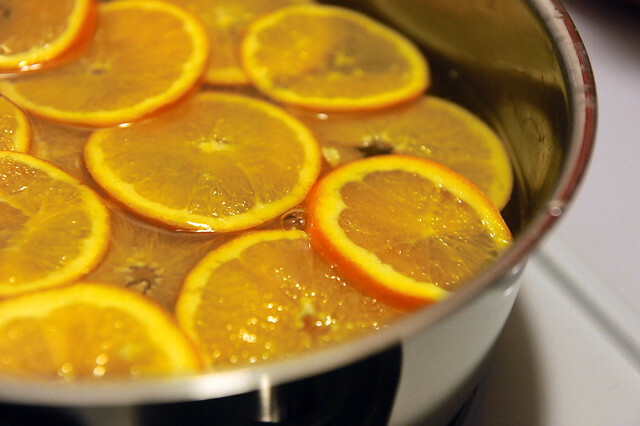 Add the orange juice and zest. Stir over low heat until smooth and thick enough to coat back of spoon. Remove from heat and transfer to a large mixing bowl and let cool. In mixing bowl, whip the egg whites until stiff (but not dry) peaks form and fold into the mascarpone mixture. Whip the heavy cream to medium stiff peaks, and fold into the mascarpone.